3D printing, also called additive manufacturing, is the process of using specialized equipment to assemble, via a computer and a 3D model, an object layer by layer. It has some unique and interesting advantages over traditional manufacturing. First, additive manufacturing allows production costs to stay the same rather there are one or a thousand units. This has several implications: it makes production available to small businesses that don’t have access to expansive funding and don’t know in advance whether they’ll have many buyers; it reduces the time between conception and sale; it allows each piece to be customized and unique; it allows greater risk­-taking by reducing the cost of failure. Second, additive manufacturing reduces lead time for short production runs and permits the creation of very complex shapes without added costs. However, additive manufacturing is still less competitive than traditional manufacturing when it comes to mass production, perfectly smooth finish, production of very large objects and the use of certain materials. To make the most of this technology, it is important to grasp its specificities. 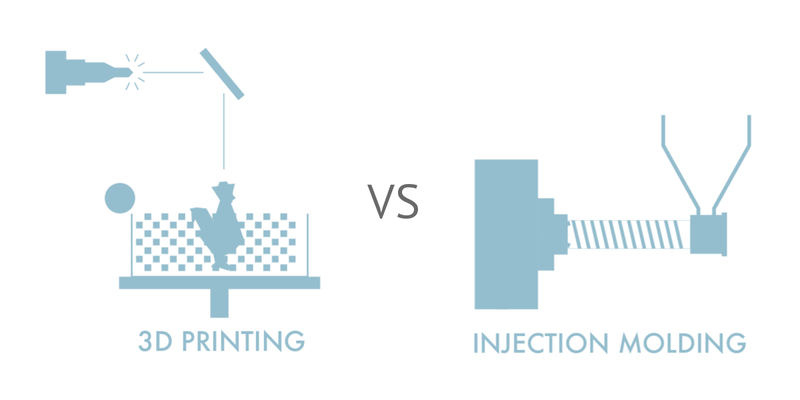 When is additive manufacturing the best choice for production? Traditional manufacturing like injection molding requires mass production to even out the overhead cost of tooling, labor for assembly, and production (an injection mold can cost thousands of dollars). On the contrary, with additive manufacturing, the cost of manufacturing of one item stays the same no matter what the quantity is, making it cheaper when the quantity is small. 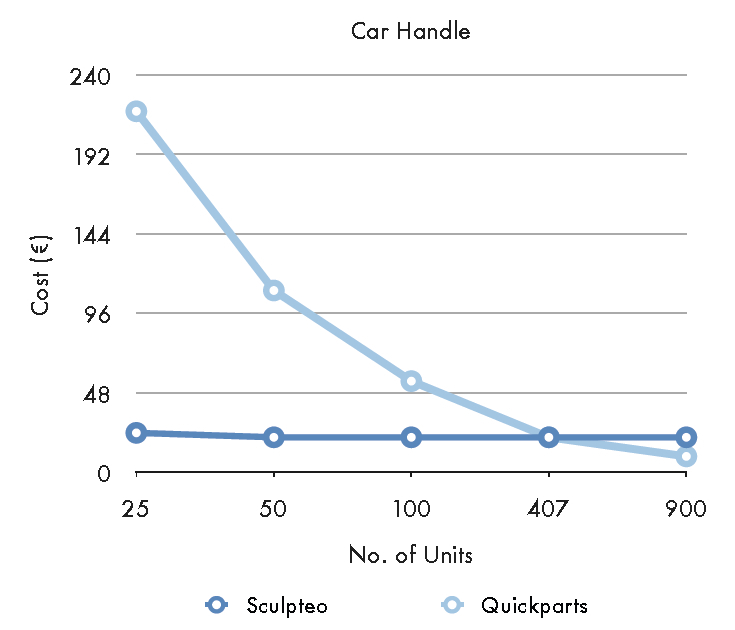 The graph, based on a study by Sculpteo, shows the compared price of a car handle produced by injection molding (Quickparts) or additive manufacturing (Sculpteo). 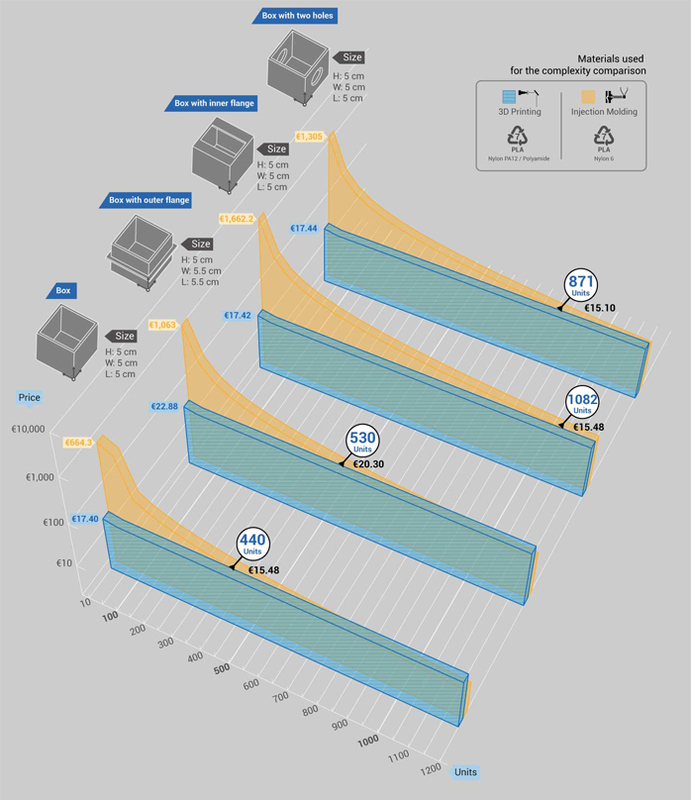 For up to 407 units, it remains cheaper to use 3D printing. Because the cost is the same for each added unit, it is possible to make an unlimited amount of changes to the product. It can be used for prototyping: you’d use 3D printing to make a prototype, and update the prototype until satisfaction. This is a crucial step before getting the product to mass production. It can also be used during the rest of the manufacturing process, to create unique pieces that can be more responsive to your needs, progress in conception and consumers feedback. Creating complex mechanical constructions via traditional manufacturing requires precision and skills, especially for the assembly of complex parts, which means that price increases with complexity. It is not the case with 3D printing, which creates an entire piece in one process, instead of creating each component before assembling. Therefore, there is no added cost for complexity. On the graph, you can see that the more complex the box is, the more expensive it gets to produce it with injection molding. The traditional manufacturing technologies require molds to be manufactured and factories to be ramped up to speed. As a result, it can take upwards of 15-60 days (and sometimes more) to have the first part in hand. For 3D printing, the part can be printed on demand and shipped without any ramp ­up or tooling, resulting in a lead time as short as 2 or 3 days. The combination of the reduced lead time and the more efficient prototyping process reduces the time to market. This is a great advantage since delay creates uncertainty. Shorter time to market means being closer to trends and having a better ability to predict success. 3D printing is incredibly resource ­efficient since the only material consumed is what passes under the laser (or through the extruder, etc. ), whereas traditional manufacturing requires the use of extra materials (molds for injection ­molding, scraps for perforated sheet metal assembly, etc.). The fact that manufacturers don’t have to produce as much of a given product to justify the setup costs also reduces waste. Customizability means that if the initial prototype isn’t satisfactory or if a change needs to be made after market launch, it won’t occasion great adapting costs as it would with traditional manufacturing. This allows to take more risks and therefore to be more innovative. Past a certain amount (refer to the chart above), it becomes cheaper to mass produce through traditional manufacturing, and we know that mass production is still a huge part of being competitive in the global market. While 3D printers might not need to be retooled in between production runs, the speed at which a 3D printer can assemble an object often pales in comparison to the traditional assembly line. Traditional manufacturing options like injection molding and forming can offer a high material selection. When it comes to 3D printing, the material selection is much sparser, which can be a limiting factor when specific materials are needed for a given part, and must be taken into consideration when deciding which technical properties you want your product to have. As the 3D printing technology matures, a greater variety of materials with varying characteristics is being introduced, slowly breaching the gap in technical properties between traditional and additive manufacturing. Materials used by 3D manufacturers like Sculpteo (such as the Tango Plus and Formlab’s Flexible resins) can now replicate the performance of certain engineering plastics (like Digital ABS and Accura PEAK). 3D printing is an additive process, which means surfaces won’t be as smooth as with processes like molding and plastic forming, and that it won’t be as easy to produce the desired surface textures. Nevertheless, our new smoothing beautifier allows to reduce the gap with injected plastic rendering and offers a really good-looking surface. The manufacture of certain large ­scale parts can be very difficult with 3D printing compared to traditional manufacturing processes since you are restricted, in size, by the area of the printing bed. In the battle between 3D printing and traditional manufacturing, there isn’t one definite winner. 3D printing gives the producer a tremendous advantage for small, one­off production runs and the manufacture of complex pieces. It also allows taking more risks, customizing the product at will, to reduce the lead time and time to market, and to reduce waste. But in some areas, traditional manufacturing still is the way to go. And even though 3D printing will most probably improve in the future, and be able to use more materials, provide a better finish, and reduce the cost per unit, its vocation is not to replace traditional manufacturing completely: it is to complement it, in order to improve production value for producers and consumers.